Lobster with black-board 6ft (JR... / p.o.s. 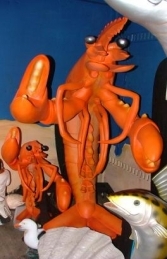 This large model Lobster is a fantastic eye catching piece, which is sure to attract attention wherever he goes! 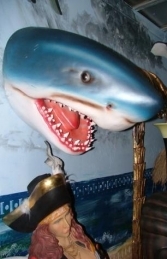 He is ideal for advertising sea-food and for aquatic scenes. Our large replica Lobster statue is a great character, he can be used to draw attention to any shops, pubs or restaurants serving sea-food. One customer regularly dresses his Lobster up in different themes, like tennis gear for Wimbledon fortnight, to attract even more customer interest. This giant crustacean model comes with a removable black-board to advertise your specials etc and a wheeled metal base for ease of movement.